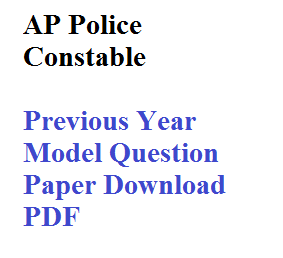 AP Police Constable Previous Question Papers with Answers PDF – Download: AP Police Constable Prelims Question papers, AP Police Constable Mains Model Papers are available now to download. Andhra Pradesh State Police Recruitment Board (APSLPRB) has recently released the Recruitment notification for AP Police Constable posts on its Official website for various vacancies. A huge number of candidates applied for the Jobs and they have started their exam preparation for the Prelims Examination. Nowadays there is very tough competition for these jobs. So all the Candidates should prepare well for the Examination to qualify in the Examination. The Examination is going to be tough. So candidates should take care of their preparation and they should prepare a perfect schedule for their Preparation. Candidates should know about the Exa Syllabus and Exam pattern and Previous papers for the Examination. Here on this page, we brought you the Previous year Question Papers for AP Police Constable Examination. Previous Question papers are very useful for the Exam Preparation. By practicing the Constable Model Question papers candidates can get the ability to answer any type of question to be asked in the Examination. and they can understand the Structure of the Exam papers and they can estimate the toughness of the Exam paper. So all the Candidates please download the Question papers available on this page. These question papers available in PDF format which makes the Download easy for the Candidates. And there is no need to pay for the Download. Candidates can download the Question Papers for Free of Cost.